Homemade cranberry sauce couldn’t get any easier than this recipe right here. Fresh flavors, bright in color, and the perfect mix of tart, sweet and tang. This recipe will be the ideal addition to your holiday feast this holiday season. Make this Instant Pot Cranberry sauce in no time for the perfect fuss-free side to serve your guests. This Instant Pot Cranberry Sauce is so delicious and so easy to make. This recipe is so easy, you are going to want to make it all of the time, not just for holidays. Homemade cranberry sauce has always been one of my favorites. I get so excited for the holidays! Now that I have my instant pot, I am able to have homemade instant pot cranberry sauce whenever I want. I love to use my instant pot all the time to recreate holiday worthy dishes that you can cook any night of the week. Try my Instant Pot Brown Sugar Carrots; you will love how delicious they are. 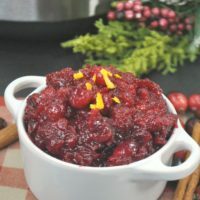 You will also want to try my Stick of Butter Rice that is a perfect companion dish for this instant pot cranberry sauce. This recipe uses basic six-ingredients. You get that fresh flavor that will make it stand out. I use this cranberry sauce when I make rotisserie chicken or even oven baked pork chops. It pairs well, and you don’t have to box it in for only the holiday season. 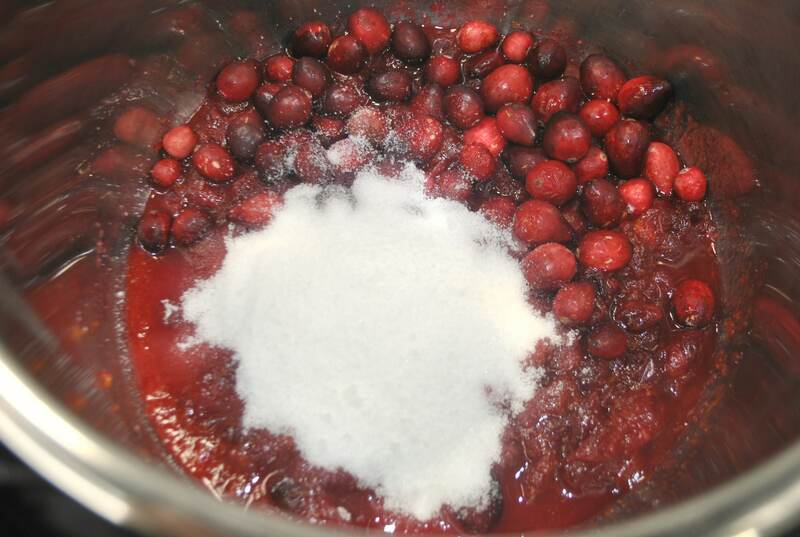 Cranberry sauce comes typically in a can, or you simmer it on the stove for hours. 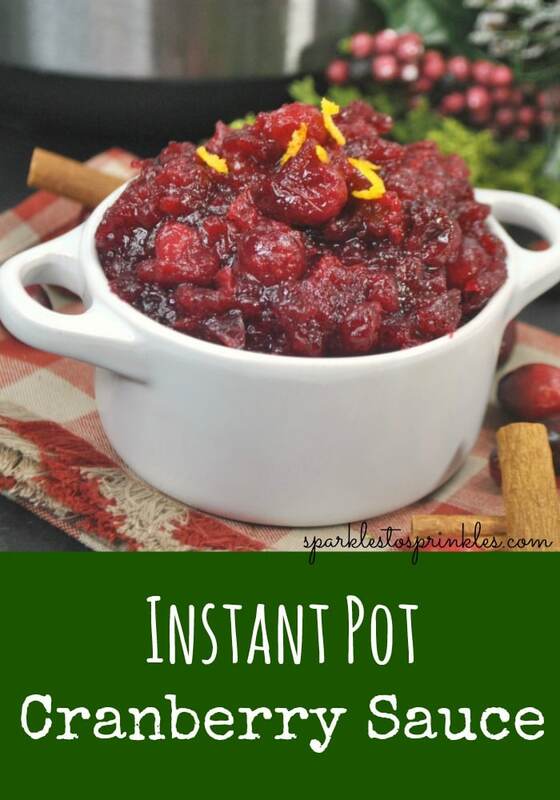 This Instant Pot recipe speeds up the process so you can have that homemade cranberry sauce taste with minimal effort or time put into it. Then just wipe out your Instant Pot and start working on other dishes to serve up. Toss this sauce in the fridge and chill until ready to serve. I know there is a lot of sugar in this recipe. I made sure to add enough sugar to help counteract the sour taste from the cranberries. If you were to bite into a cranberry you would taste that exact sour flavor you want to get rid of. The sugar is needed to help sweeten and lower the tart and sour factor. It is the perfect amount of sweetness and works well. So don’t shy away, the sugar is a must. Cranberries are considered a superfood, and that is why they are great to incorporate into your diet all year round. From dried cranberries to topping your proteins, or sprinkling in oats, you will gain a lot of benefits from these deep red gems. Cranberries are packed with antioxidants, vitamin C, and even fiber. These little berries outrank almost all other fruits in vegetables in carrying the most disease-fighting antioxidants (grapes, apples, cherries, broccoli, spinach, strawberries). Are you a fan of cranberries? 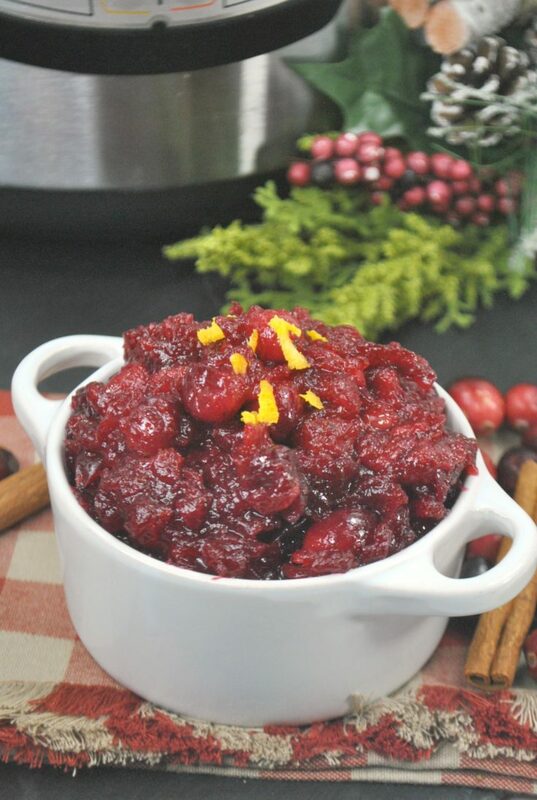 Instant Pot Cranberry Sauce is such a delicious treat. No one will believe how easy it was to make. Prepare the cranberries by washing them, pat dry. In a small bowl mix together the maple syrup and orange juice. Pour the mixture into the instant pot. Add cranberries into the instant pot. Close lid and seal the vent to closed. Set at High Pressure for 1 minute. Natural release for 7 minutes. Open the vent and release remaining pressure. Stir the cranberries, scraping the sides also. 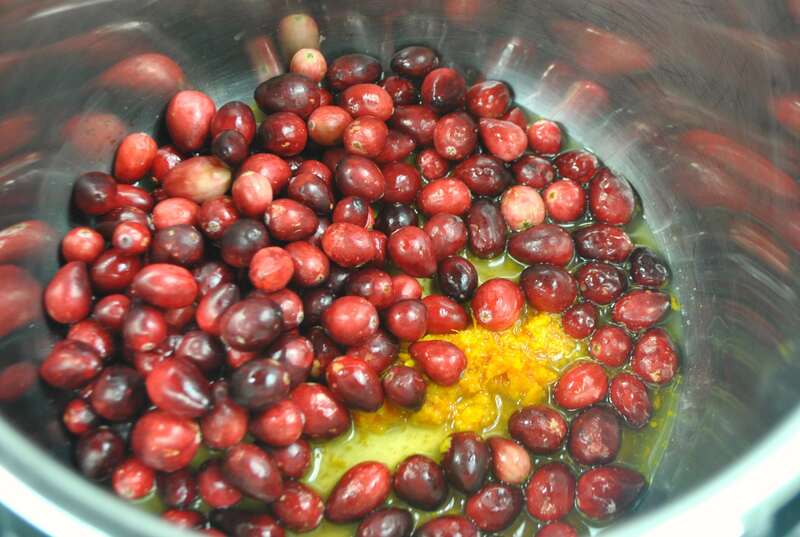 Lightly mash the cranberries down with a wooden spoon. Add the sugar, and salt.